The ETC group – the Action Group on Erosion, Technology and Concentration – describes itself and its work as being dedicated to the conservation and sustainable advancement of cultural and ecological diversity and human rights. 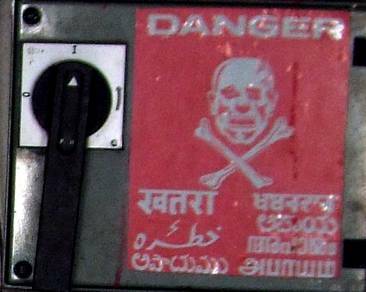 Amongst the financiers, diplomats, agents, fixers, saboteurs, rogues, destructive multi-lateral banks, geoengineers, evil biotech corporations and assorted carpetbaggers, there are some NGOs who are taking the sensible route. The ETC Group is one of these. ‘The New Biomassters – Synthetic Biology and The Next Assault on Biodiversity and Livelihoods’, a groundbreaking report that lifts the lid on the emerging global grab on plants, lands, ecosystems, and traditional cultures. 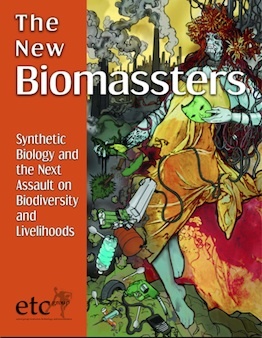 The New Biomassters is a critique of what OECD countries are calling ‘the new bioeconomy.’ Concerted attempts are already under way to shift industrial production feedstocks from fossil fuels to the 230 billion tons of ‘biomass’ (living stuff) that the Earth produces every year -not just for liquid fuels but also for production of power, chemicals, plastics and more. Sold as an ecological switch from a ‘black carbon’ (ie fossil) economy to a ‘green carbon’ (plant-based) economy, this emerging bioeconomy is in fact a red-hot resource grab of the lands, livelihoods, knowledge and resources of peoples in the global South, where most of that biomass is located. In how many languages does the Cancún talkfest need to hear the word 'danger'? 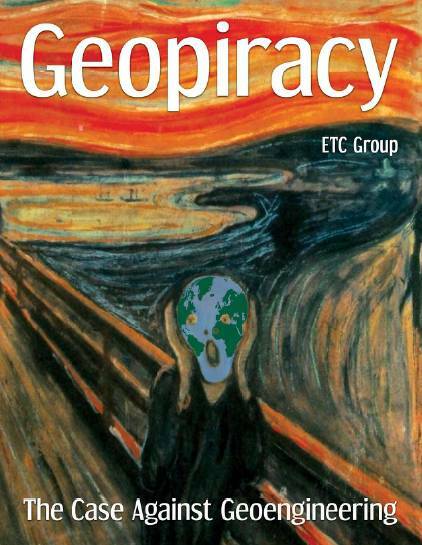 ‘Geopiracy: The Case Against Geoengineering’ examines the high stakes involved in the rapidly advancing field of geoengineering – the intentional, large-scale manipulation of the Earth’s systems by artificially changing oceans, soils and the atmosphere. More than a set of climate altering technologies, geoengineering is a political strategy aimed at letting the industrialized countries off the hook for their climate debt. This report will help civil society organizations navigate the coming global debates over the science and politics of climate-change techno-fixes. In ‘Gene Giants Stockpile Patents on ‘Climate-Ready’ Crops in Bid to Become Biomassters’, the ETC Group says that under the guise of developing “climate-ready” crops, the world’s largest seed and agrochemical corporations are filing hundreds of sweeping, multi-genome patents in a bid to control the world’s plant biomass. ETC Group identifies over 262 patent families, subsuming 1663 patent documents published worldwide (both applications and issued patents) that make specific claims on environmental stress tolerance in plants (such as drought, heat, flood, cold, salt tolerance). DuPont, Monsanto, BASF, Bayer, Syngenta and their biotech partners account for three-quarters (77%) of the patent families identified. Just three companies – DuPont, BASF, Monsanto – account for over two-thirds of the total. Public sector researchers hold only 10%. The Group’s strength is in the research and analysis of technological information (particularly but notes exclusively plant genetic resources, biotechnologies, and [in general] biological diversity), and in the development of strategic options related to the socioeconomic ramifications of new technologies. Another NGO-advocacy taking the sensible route is the International Centre for Trade and Sustainable Development, which is also at Cancún, Mexico, for the climate summit. ICTSD says that the fourth assessment report by the IPCC (Intergovernmental Panel on Climate Change), the Stern Review of the economics of climate change, the Bali Action Plan and multiple authoritative studies have all highlighted the critical role that economic instruments, markets, and regulatory tools will play in efforts to address climate change. Who says 2°C more is 'safe' for us? Laudable and good. The trouble is that the idea of a responsible economy – the current trade-finance-exploitation economy – is as daft as the ideas of “green growth” and “clean coal”. Such labels would be comical if they weren’t being bandied about by all those entities I described in the first paragraph. Lobbying groups, industry associations and banks are turning these – and others such as “fast-track climate financing” – into full-time consulting industries with their own revenue sources. Far away from the victims and the dishoused and the jobless, these groups are driven by the same profit motive that led to the 18th century colonial race for new territories and resources. A bicentennium later, the stage has changed and the threat of climate change has become living fact, but greed and exploitation are ever at the forefront.